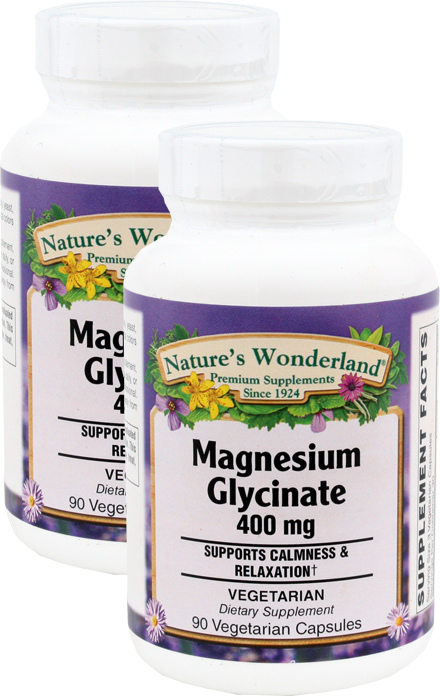 Magnesium Glycinate - 400 mg, 90 vegetarian capsules each (Nature's Wonderland) - Penn Herb Co. Ltd.
Magnesium helps the body respond naturally to stress and supports a deep sense of relaxation. 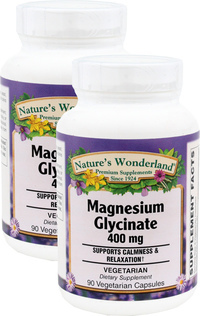 Nature's Wonderland Magnesium Glycinate is in a readily absorbed form that is preferred by those who need therapeutic doses that won't cause stomach distress. Magnesium glycinate is highly bioavailable or most utilized by the body, and is better absorbed than other forms of supplemental magnesium. Get the preferred Magnesium for relaxation & stress support. Energy production and metabolism; nervous system support; neuromuscular health; muscle contraction, helps relaxes muscle; supports bone mineralization; works with Calcium to maintain bone health. Helps regulate blood glucose; mineral support for mild mood changes and cramps associated with the menstrual cycle; supports healthy kidney function. As a dietary supplement, adults take 3 vegetarian capsules daily, or as directed by a healthcare professional.